Between 1860 and 1864 the Cambrian Railway extended railway services in the area and took over the Llanidloes and Newtown Railway. A new line connected Llanidloes with Brecon down the Wye valley and a line West through the mountains to the coast was planned. (See the page on Llangurig in 1866). This never got further than Llangurig though. 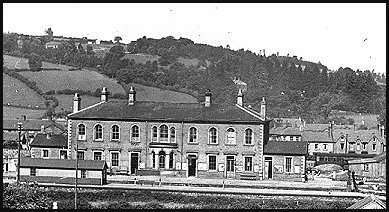 The Cambrian Railway built a fine new station at Llanidloes as the Headquarters of these operations. There was a goods warehouse for the storing of goods to be sent by rail, and a cattle shed for the livestock. (see pages on Van lead mines). Also in the 1860's a railway was opened from Caersws over to Machynlleth and the coast, making Caersws an important junction (see Victorian map of Caersws). This is the only one of these Victorian railways in the area still running today.